The people who got caught up in the exercise boom of the 1970s and stuck with it into their senior years now have significantly healthier hearts and muscles than their sedentary counterparts. Take 74-year-old Susan Magrath, a retired nurse practitioner who lives in Muncie, Ind. Magrath has been running almost daily for 45 years. She often runs outdoors and describes it as addictive. "It's just such a release, just a wonderful release," she says. "I ran today and there were little snowflakes coming down, and I was down by the river and it's just wonderful. And I think it's become more of a contemplative meditative process for me." Magrath may be living proof that lifelong exercise helps with cardiovascular and muscle health. She recently took part in a study at the Human Performance Laboratory at Ball State University, also in Muncie, headed by exercise physiologist Scott Trappe. Trappe is among the first to study the enticing new population of lifelong exercisers. After the running and aerobic boom of the 1970s, large numbers of septuagenarians stuck with it and have been exercising regularly for the past 50 years. In this population, Trappe says, "We were interested in basically two questions: One, what was their cardiovascular health? And two, what was their skeletal muscle health?" What he saw surprised him. "We saw that people who exercise regularly year after year have better overall health than their sedentary counterparts. 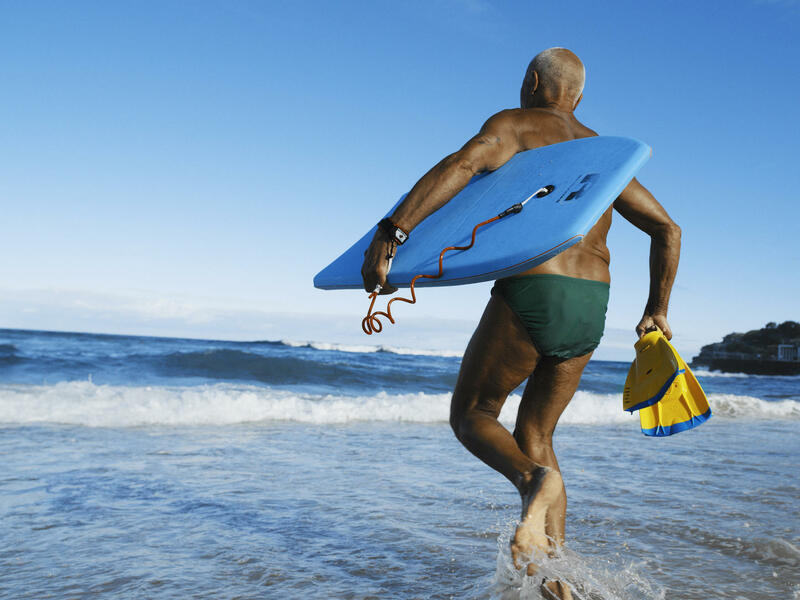 These 75-year-olds — men and women — have similar cardiovascular health to a 40- to 45-year-old." " 'Exercise wins' is the take-home message," he says. In the study, Trappe divided 70 healthy participants into three groups. Those in the lifelong exercise group were on average 75 years old and primarily kept their heart rates up through running and cycling. They had a history of participating in structured exercise four to six days a week for a total of about seven hours a week. The second group included individuals who were also, on average, 75 years old but did not engage in structured exercise regimens, although they might have participated in occasional leisure walking or golf. The third group consisted of young exercisers who were, on average, 25 years old and worked out with the same frequency and length of time as the lifelong exercisers. All participants were assessed in the Human Performance Laboratory at Ball State University. Cardiovascular health was gauged by having participants cycle on an indoor bike to determine VO2 max, also known as maximal oxygen uptake, which is the measurement of the maximum amount of oxygen a person can use during intense exercise and is an indicator of aerobic endurance. During the cycling test, which became increasingly challenging, individuals exhaled into a mouthpiece that measured oxygen and carbon dioxide levels. The aerobic profile of the participants' muscles was measured by taking a sample via a biopsy about the size of a pea, says Trappe. Then in the lab, researchers examined the micro vessels, or capillaries, that allow blood to flow through the muscle itself. They also looked at specific enzymes that provide fuel to the working muscle and help break down carbohydrates and fats. Although the study was relatively small, the findings, which were published in the Journal of Applied Physiology in August, suggest a dramatic benefit of lifelong exercise for both muscle health and the cardiovascular system. "Lifelong exercisers had a cardiovascular system that looked 30 years younger," says Trappe. This is noteworthy because, for the average adult, the ability to process oxygen declines by about 10 percent per decade after age 30. "It's kind of a slow decay over time that's probably not so noticeable in your 30s or 40s," says Trappe, but eventually as years go on, becomes apparent. People can get out of breath more easily and may have difficulty pushing themselves physically. The age-related reduction in VO2 max is directly associated with an increasing risk of multiple chronic diseases, mortality and loss of independence. Maintaining a strong heart and lung system has been shown to decrease these health risks. As for muscle health, the findings were even more significant, says Trappe. Trappe says researchers were surprised to find the 75-year-old muscles of lifelong exercisers were about the same as the muscles of the 25-year-olds. "If I showed you the muscle data that we have, you wouldn't know it was from an older individual. You would think it's from somebody that's a young exerciser," he says. David Costill, 82, was not part of the study but is a former colleague of Trappe's and professor emeritus of exercise science at Ball State University. As an exercise physiologist, he has always known about the benefits of exercise and has been committed since high school. He says he has spent about "60 years actively exercising." Costill ran marathons for about 20 years until his knees started to bother him, so he headed to the pool. "And I've been swimming for the last 35 years." When Costill looks at his friends, he says he finds he can do a lot more physically than they can. "If I'm out with a group of my peers, guys who are near 80, and we're going someplace, it seems to me they're all walking at half speed." Trappe says the findings are clear: 30 to 60 minutes of exercise a day may be the key to a healthy life. But you don't have to run marathons or compete in cycling events. "If you want to do 30 to 45 minutes of walking a day, the amount of health benefit you are going to get is going to be significant and substantial," he says. "Will it equal the person training for competitive performances? No. But it will outdo the couch potato." Unfortunately, couch potatoes are the norm. Federal guidelines recommend two hours and 30 minutes of moderate exercise a week, or one hour and 15 minutes of vigorous exercise per week. Yet 77 percent of Americans do not come close to getting that amount of exercise. Dr. Clyde Yancy, spokesperson for the American Heart Association and chief of cardiology at Northwestern University Feinberg School of Medicine, says the findings suggest "a lifelong investment in health and fitness appears to be associated with a really sustainable benefit out until the outer limits of life." Since we are living longer, maintaining a good quality of life is more important than ever. While the study was small and the findings need to be confirmed, they present a "strong argument" for lifelong exercise that is inexpensive and accessible for everyone. "If you can swim, do yoga, cycle, or walk," you can benefit," Yancy says. We know that exercise benefits health - kind of obvious. And we're learning more about that. Researchers find people who exercise regularly throughout their lifetimes may be able to keep their hearts and muscles decades younger. NPR's Patti Neighmond reports on the study published in the Journal of Applied Physiology. PATTI NEIGHMOND, BYLINE: It started in the '70s - running, aerobics - an exercise boon that produced today's 70-somethings who've exercised most of their adult life like 74-year-old Susan Magrath, a retired nurse practitioner who started running as a young mother. SUSAN MAGRATH: And have spent about 45 years running. I still run. NEIGHMOND: It's addictive, she says, because no matter how the day goes, she can always run and feel better. MAGRATH: I ran today actually. There was little snowflakes coming down, and it was down by the river. And it's just wonderful. I think it's also become more of a contemplative meditative process for me. NEIGHMOND: And it turns out an important boost for her physical health as well. Magrath was part of a study at Ball State University in Muncie, Indiana, headed by exercise physiologist Scott Trappe, who divided 70 people into three groups - those in their mid-70s who exercised on average for over 52 years, those in their mid-70s who didn't do structured exercise, and those in their mid-20s who did. Trappe compared the three groups with the goal of answering these questions. SCOTT TRAPPE: One, what was their cardiovascular health? Number two, what was their skeletal muscle health? NEIGHMOND: To measure cardiovascular health, all participants cycled on a stationary bike for increasingly challenging sessions and exhaled into a mouthpiece that measured oxygen levels, an indicator of cardiovascular strength. TRAPPE: Lifelong exercisers did very well. Their cardiovascular system looked more like that of 40- to 45-year-olds. NEIGHMOND: And when it came to muscles, the news was even better. TRAPPE: Well, if I showed you the muscle data that we have, you wouldn't know that it was from an older individual. NEIGHMOND: Because it looks more like the muscles of a 25-year-old. Trappe took pea-sized biopsies of muscles and examined capillaries that produce blood flow and a number of enzymes. TRAPPE: The capillaries and enzymes we're talking about were maintained relative to the young individuals. So it looks like full preservation with the lifelong exercise. NEIGHMOND: So Trappe says if you want to maintain health in later years, exercise routinely. Walking 30 to 45 minutes most days of the week can be highly beneficial. Patti Neighmond, NPR News. (SOUNDBITE OF KHURANGBIN'S "PEOPLE EVERYWHERE (STILL ALIVE)") Transcript provided by NPR, Copyright NPR.